New: A new cookbook, containing 101 recipes, created by Autumn Calabrese was recently launched. Snacks, breakfast, launch and dinner recipes. All 21 day fix approved and with all the information you need regarding containers and nutritional information. Would you like to know more ? 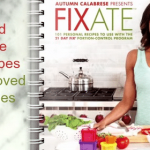 Read my Fixate Cookbook review here. Staying on the 21 Day Fix diet plan will be easier when you know all of the best snack recipes. One of these is homemade apple chips, which offer delightful sweetness, as well as plenty of welcome nutrition. In addition, since apples are typically very affordable, you’ll find that this diet-friendly snack idea won’t bust your budget. You may share these tasty apple chips with friends or family or nosh on them all by yourself! In terms of which apples to choose for this 21 Day Fix approved recipe, it’s really a matter of personal preference. However, the tartness of bright green Granny Smith apples will work well! Other options include classic Red Delicious apples or juicy Spartan apples. 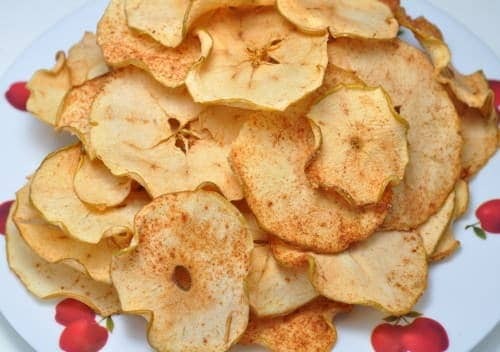 You won’t need to spend a bundle at the grocery store or farmer’s market in order to make these luscious and nutritious apple chips. All that you’ll need is a single apple and a bit of cinnamon spice. If you don’t like cinnamon (or don’t have the spice handy! ), just leave it out. Apples are great on their own – however, the cinnamon will provide a bit of depth, so many people do love adding this classic spice. You’ll also need parchment paper in order to keep the apples in good condition as you bake them. Parchment paper isn’t expensive and it available via most grocery stores or dollar stores. Next, you’ll need to pre-heat your oven. Two hundred degrees will be just right. Once this oven is pre-heated, it will be time to prepare the apple. First, core the fruit and then cut the apple into thin slices. You will want the slices really thin, so cut carefully with a paring knife. Then, prepare a cookie sheet for baking by covering it with parchment paper. Once the parchment paper is in place, lay out the apple slices and season them with pinches of cinnamon – it’s up to you how much cinnamon to add. You’ll need to bake these for quite a while, as the heat level will be fairly low. So, bake them for 45 minutes on one side and then flip them. Bake them for another 45 minutes. Then, you are done! Remove them from the oven, transfer them to a plate and enjoy. Sometimes, life gets really busy and it’s impossible to do complex meal prep. 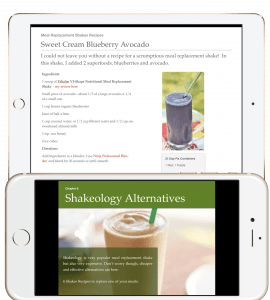 If you’re committed to staying on the 21 Day Fix diet plan and you need to find a meal replacement shake recipe,shakeology alternatives, which will allow you to get the nutrition that you need quickly, you’ll enjoy discovering – and trying out – our recipe. Our shake may be poured into a portable travel mug and then taken along with you wherever you go. It may also be guzzled quickly whenever you need some calories and nutrition at home. So, this recipe offers a lot of versatility, as well as great taste! Just pour these ingredients into your blender, the blender I use and my recommendations, and then pulse or blend them until they are smooth. Making this type of meal replacement shake will be really easy and it will help you to meet your 21 Day Fix goals. Once you’ve got the basic recipe down pat, you’ll be ready to change it up whenever you feel like it. For example, you’ll be able to change fruits and veggies and alternate nut butters in order to get interesting taste effects. We recommended spinach as a veggie because it tends to blend into drinks without being too noticeable. However, plenty of veggies may be utilized. What’s most important is that you choose a protein powder which is compatible with the 21 Day Fix program. You can find here our selection of the best protein powders to use. Now that you know this convenient and easy meal replacement recipe, you’ll be ready to get nutrition, even when life is super-hectic. This will make it much easier to stay on your diet. 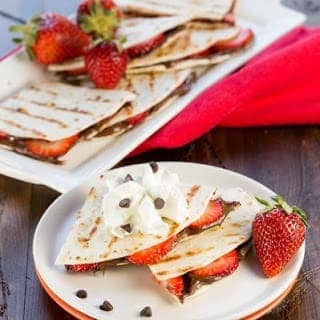 Now, let’s discuss the ingredients that you will need in order to make these awesome delicacies, which are perfect for snacks, healthy breakfasts or light lunches…you’ll be able to make three servings of Fruity Quesadillas when you follow our simple instructions. In terms of containers for 21 Day Fix, this recipe will fill one purple container, one yellow container and one “teaspoon” container. First, purchase a package of whole-wheat tortillas – you’ll only need three of them, but they are typically sold in larger packages. These are pretty affordable and they are available at most grocery stores. Next, you’ll need to buy a banana and a package of strawberries – look for a package of strawberries with at least nine berries in it. In addition, you’ll need three teaspoons of your preferred nut butter. You may select almond butter, peanut butter or whatever you like best. Lastly, you’ll need a bit of cinnamon in order to add a spicy-sweet kick to your quesadillas. You’ll add cinnamon to taste. Now, add one teaspoon of nut butter to each tortilla and then add one-quarter of the bananas and one-third of the berries. Add a pinch of cinnamon to each tortilla. Next, put the tortilla on the fry pan and then grill until it is light brown (and the nut butter is soft and warm). Then, fold the tortilla in order to create a quesadilla. As you can see, this recipe is just so easy to make. So, why not try it today? Chickpeas have lots of protein, they aren’t high in fat and they are fine choices for those who follow the popular (and simple and sensible!) 21 Day Fix diet/fitness plan. 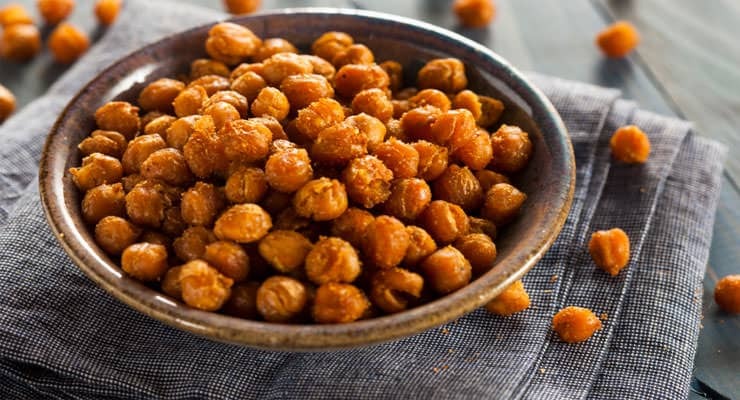 If you love chickpeas and you want to enjoy them in a whole new way, you’ll find that roasting them is the secret of discovering an amazing new snack idea which won’t short-circuit your fitness and weight loss goals. So, let’s talk about how to roast chickpeas…you’ll find that it’s incredibly easy to do so and that these tasty legumes may be customized with the seasonings of your choice! To get started, you’ll need a large, flat baking pan. In addition, in terms of ingredients, you’ll need a can of chickpeas, a bit of olive oil and the seasonings that you like best. Examples of seasonings to consider include no-fat Italian dressing, lemon juice, garlic salt and/or plain old salt and pepper. Fresh herbs are also fine choices – dill or oregano will work. Basically, anything goes in terms of seasonings, as long as they are acceptable within the rules of the 21 Day Fix! Drain and rinse your can of chickpeas – then, dry them between a couple of sheets of clean paper towels. This will allow the olive oil to adhere to them. In addition, it will remove the skins of the chickpeas. Next, place the dried, de-skinned chickpeas in a bowl and then add a couple of teaspoons of the oil. After this, cover a baking sheet in aluminum foil and preheat your oven to four hundred and twenty-five degrees. Put the oiled chickpeas on the baking sheet and then bake them for about forty minutes – they should be brown and crisp when they are taken out of the oven. Lastly, season your tasty roasted chickpeas by adding your preferred spices, dressings and/or juices. A bit of garlic salt will work well if you’re not sure what to add, but don’t overdo it, as garlic salt is pretty potent. You will not need much in order to get a spicy kick. Then, enjoy them as is or add them to recipes. As you can see, this diet-friendly snack is designed to satisfy and it’s really easy to make. Chickpeas are fresh and natural, they aren’t expensive at all and they may be enjoyed day or night. So, what are you waiting for? Try this snack recipe today! If you love yogurt, you’ll benefit from learning how to make a delicious, creamy and cool yogurt smoothie! Our recipe is perfect for 21 Day Fix followers, due to its healthy, “clean” ingredients. In addition, this recipe is really versatile, which means that you’ll be able to modify it with your choice of add-ons. Now, let’s talk about how to create this yummy smoothie, which is made with delectable and refreshing Greek yogurt. First, you’ll need to grab some zero-fat Greek yogurt. Choosing the fat-free version will help you to follow your 21 Day Fix diet plan and it will still give you access to plenty of welcome nutrition, including lots of energizing, muscle-building protein. While this recipe isn’t totally carb-free, it’s a safe 21 Day Fix snack nonetheless. 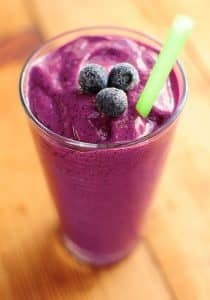 This smoothie recipe, more yogurt smoothies recipes here, will also work with the 21 Day Fix Extreme diet and fitness program. Perfect for kids of all ages, this shake isn’t just for 21 Day Fix devotees. You’ll need at least six ounces of Greek yogurt. In addition, you will need a cup of berries, whether they are fresh or frozen. Also, have some spinach on hand – you won’t need more than a handful of this veggie. One-fifth of a banana will also be needed. To sweeten the recipe a bit, add a packet of Stevia if you wish to. Lastly, you’ll need to add just a bit of water in order to ensure that your smoothie has a truly drinkable texture. Just put all of the ingredients into a blender, blender I use and my recommendations, and then mix them together. Use a bit of water in order to create a preferred texture. In terms of the 21 Day Fix containers, this smoothie counts as one red, one purple and one green. Now that you know just how easy it is to make this healthy smoothie, you’ll be ready to enjoy it anytime. Perfect as a snack or a meal replacement drink, this recipe is fun to play with, so don’t be afraid to change ingredients in order to make it your own! 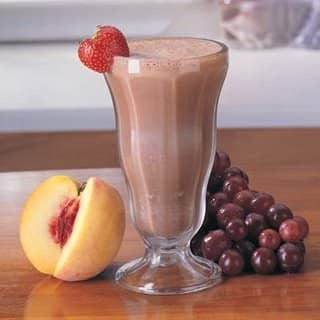 It’s best to make this shake fresh each time that you want to enjoy it. We chose spinach as the veggie because its taste is impossible to detect. This means that you’ll get all of its nutrition, including energizing iron, without the taste of the veggie. If you have kids, you’ll find that this shake is a great way to “sneak” a little healthy spinach into their diets. Subscribe to our newsletter, join another 9,500 great people and instantly download your own copy. Super excited to try the chickpeas… I am trying to find crunching things to eat for me snacks to replace the chips!! I love cooked veggies but dislike raw so my diet has lacked anything crispy 🙁 Thank you for this recipe! !